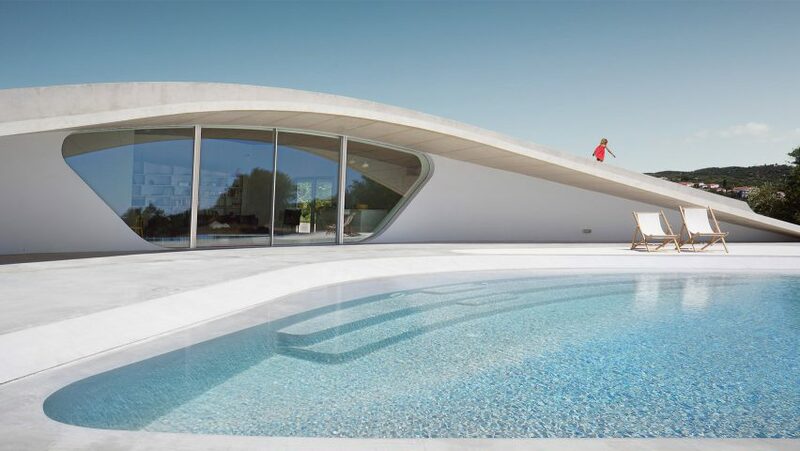 Fingers of earth branch over this mound-shaped holiday home by architecture studio LASSA, allowing its owners to climb up onto the roof to admire Greece's Peloponnese peninsula. The domed form of the summer house responds to the client's desires for a vantage point from which to survey the agricultural land, as well as the nearby mountains and coastline. "The axis of the vaulting roofs are specifically aligned with the island of Schitza towards the south and a bucolic village on the mountain towards the east," Lalis told Dezeen. "Another requirement was to design a layout that activated all the periphery of the building, instead of only favouring panoramic sea views." The three-pronged concrete shell that forms the roof also frames three courtyards at ground level, which all catch the sun at different times of day. The facades scoop inwards to give these terraces the benefit of the shade provided by a concrete lip that defines the grassy roof. One hosts an eye-shaped swimming pool and sun deck, while another forms a gravelled patio. The final segment hosts a sunken seating area. "The design of the concrete shell and the courtyards' orientation is such that it produces shadows at specific times of the day," said the architects. They explained that that the western courtyard is designed for between breakfast and noon, the east is best to sit in at lunchtime, and the south is for use from late afternoon onwards. "We are interested in the idea of form integration," they continued. "That is, that form can be the result of overlapping and precise design decisions, in this case the vaulting concrete shell is structural, it's bisecting axes frames specific views, its sloping [form] makes it walkable and its extent is a result of environmental optimisation." Inside, three bedrooms and a pair of bathrooms are set towards the east, while the open-planning living space occupies the south and has access to all three courtyards. Due to the site's remote location, the architects needed to prefabricate much of the structure offsite. This helped to keep both assembly costs down and the construction time to seven months. The architects bought a CNC machine to allow them to test out the non-standard forms found in the project. They prototyped the production of the concrete shell, the acoustic ceiling of the living room, custom window frames and furniture, and the pool lining using this technique. "This 'hands-on' approach allowed for a minimal use of commercial 'off-the-shelf' products while instead favouring locally sourced materials such as concrete, terrazzo and marble," they explained. Photography is by NAARO unless otherwise stated.